We believe our product goes beyond selling real estate in Madison, WI. When a person works with Alvarado Real Estate Group, they should feel that things are done professionally to ensure that details of the real estate transaction are well attended to and that the people involved in the process are treated with care and respect. No matter how detached a person is to their house, there are still emotional aspects to selling a home. There is the home itself and there is the unknown of how the process will unfold; when the right buyer will walk through the door and how to navigate the last couple of days prior to closing. When you talk to people who have worked with Alvarado Real Estate, you will hear that the value we bring to the table is much more than just the listing and negotiation of the transaction. 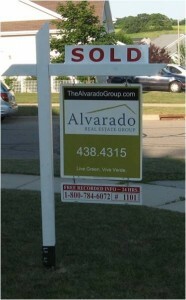 Alvarado Real Estate provides Security, Experience, Trust, Peace, Control (over things we can control), and Confidence. A little bit of fun is always included too. Passionate about what we do… Compassionate about the people we work with. Our website has some great places to start as you prepare and gather information on selling a home in the Madison area. Check out the Seller Tips page or fill out the contact form in the sidebar to receive information from a Listing Specialist on what it takes to sell in today’s market.